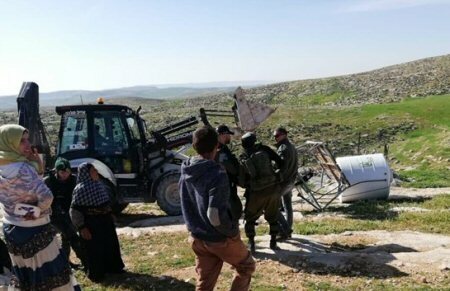 Israeli forces demolished two Palestinian homes on Wednesday, at noon, in the South Hebron Hills of the occupied West Bank city of Hebron. Fouad al-Umour, coordinator of a local popular committee, reported that Israeli forces demolished a residential room belonging to local resident Issa Awad, in the Umm Tuba village, and seized a water tank and solar panels. Al-Umour said that Israeli forces also demolished a house belonging to Ali Muhammad Abu Arram, in the Halaweh village. The South Hebron Hills, known locally as Masafer Yatta, lie almost entirely in Area C, the 62 percent of the West Bank under full Israeli civil and security control since the 1993 Oslo Accords, Ma;an further reports.